1. 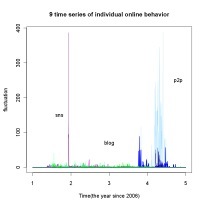 There are universal scaling laws in human online behavior, which includes writing blogs, making friends and sharing files. While the scaling law is uniform, the exponents may vary from one user to another. 2. 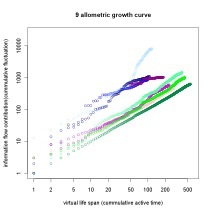 It can be mathematically proved that given the power law distribution (or its revised version DGBD) of the fluctuation in one’s online behavior, we can predict the power law relationship between the cumulative active time and the total amount of fluctuation (the blogs written or the friends made in sum), which can be named as allometric growth. 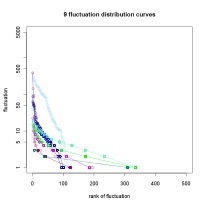 To explore the further one, we found that the flow distribution of maze web in each hour is an unchangeable DGBD distribution; to testify the letter one, we found that the flow fluctuations in random selected users’ time series also confirm to a DGBD distribution.As allometric growth relationship can be mathematically derived from DGBD distribution, the allometric growth in population vs information flow (spatial aggregation) and time vs information flow (aggregation in time) are also predictable patterns.